The renderings and photos are of a sample set of lattice designs that have been used in past projects. Each lattice design has its potential uses; some are better for achieving stiffness, whilst others are better at providing a variation in flexibility. Many of the lattice designs are buildable in both metals and plastics as can be seen in the photos. Some samples also demonstrate our ability in varying the density of the lattice continuously. The volume reduction coefficient is the potential weight reduction that is achievable by replacing a solid component with one that is instead filled with a lattice (e.g. a volume reduction coefficient of 0.2 means that the part now weighs only 20% of the weight of the equivalent solid part). 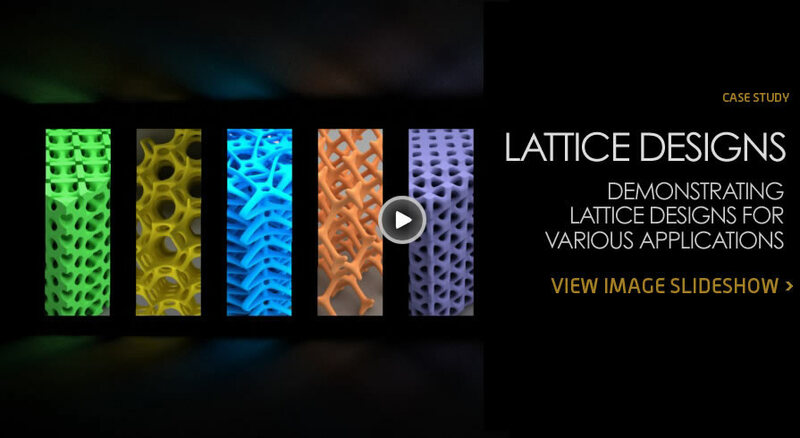 These lattices are available in Autodesk Within.